YouNeverCall, an online cellphone retailer, decided to break new ground in terms of business by moving into the virtual one. They have a ready market of 1.5 million potential customers by jumping straight into the Second Life online community, offering a fully functional in-game cellphone for free. 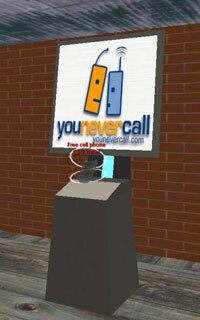 These virtual cellphones in Second Life are meant to be more than an accessory that offers meaningless fun – YouNeverCall will incorporate actual cellphone features in the virtual world by enabling them to ring, and there is no need to download any additional module to snag one for yourself. All you need to do is to head on here to get your very own virtual cellphone. These free cellphones can be used to retrieve important information like real world U.S. stock quotes, the exchange rate between the Linden dollar (currency used in Second Life) and the U.S. dollar, as well as retrieve or send text messages to your friends who have cellphones in the Second Life world. Another advantage of picking up a cellphone in Second Life is the non-existent cost unlike other things in Second Life that require a minimal fee. Waste no more time reading and head on to the YouNeverCall virtual kiosk in Second Life which is conveniently placed within the Alston region at coordinates 95, 58, 22, which is nearby a Lindex ATM. Who knows, you might even be more popular in the virtual world due to your ability to interact better with digital avatars while you stutter in front of real people made from this thing called flesh and blood. A really neat idea, although it means more management in your life as you have yet another number to keep track of. Roll your own Toast, designer style. A new award winning toaster design that Rocks!